Landscape Archaeology student Anne Landskron, who studies at Freie Universität Berlin, recently finished a two month internship with us. 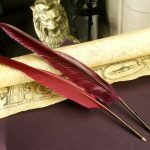 In this blog post she talks about what she learned. Before I came to Scotland I didn’t know much about the country. Of course I’ve heard stories about its wild landscapes, the strong connection between land and people, and a little about the rich textures of the various kinds of whisky. But I received my Bachelor’s degree in Near Eastern Archaeology, so fairy tales were all I really knew – until my archaeology internship at Historic Environment Scotland. It turned out to be two very rewarding months full of wildlife, history, and changing landscapes. An archaeological landscape – Cairn Holy Chambered Cairn I, one of two Neolithic chambered tombs overlooking Wigtown Bay. Over the course of my placement I had the opportunity to work within four different departments of HES, scattered over three different offices, and was tasked with a wide variety of responsibilities. I started with the Rangers based in Edinburgh’s Holyrood Park and I can’t think of a better introduction to understanding all of the different dynamics which shaped the city and the land. Every Ranger has a unique view of the park. It’s a place where you’ll learn about the first settlements in the area, hill forts, and Arthur’s Seat – which is a landmark not only in the present but in the past as well, creating a conscious perception of space through time. I also learnt about the different social dynamics influencing the park. For instance, the name of the residential area beside the park ‘Dumbiedykes‘ tells a story about the society of the 18th century and the first organised school for the Deaf (Braidwood’s Academy). But the stories are not all about people. I learned about changing wildlife and vegetation in the park, and how keeping the site open and accessible impacts on this. 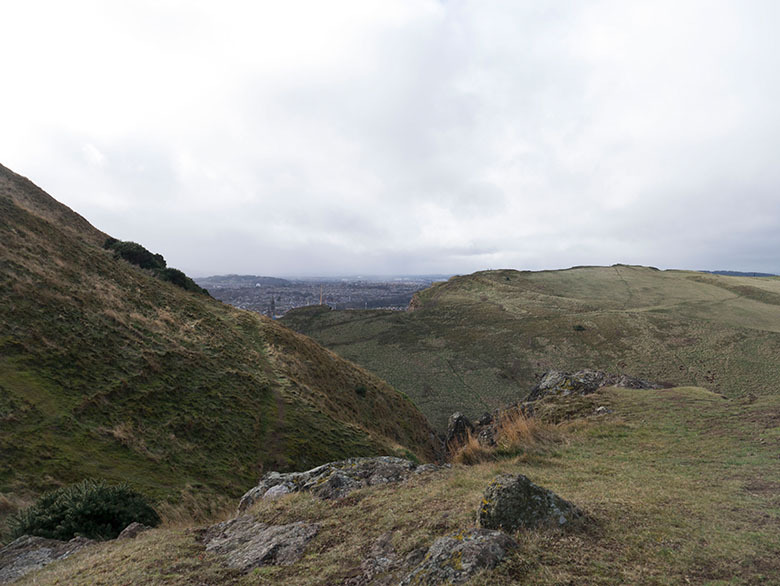 The challenge of how to protect a historic place like Holyrood Park from erosion, and at the same time provide free access to the public, is not easy to solve. From the very beginning, I felt right at home in Holyrood Park. Every day – on my way to work or back home – I tried to get to know every inch of this beautiful place in the centre of Edinburgh. The next few weeks were filled with several projects, each bringing me closer to a different corner of Scotland by highlighting a new part of Scottish history. 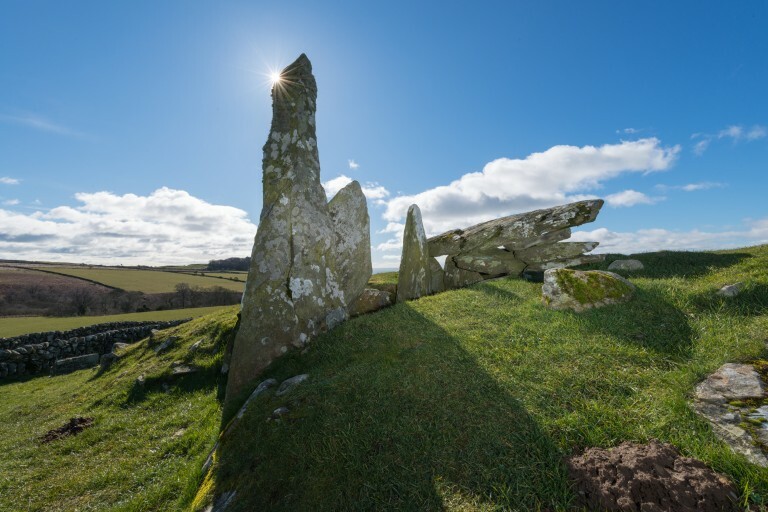 The Cultural Resources Team introduced me to the ‘Properties in Care’, more than 300 places across Scotland that HES looks after from Skara Brae to Stirling Castle. I was tasked with looking specifically St Andrew’s Cathedral, and soon dived into old archive files to recover as much data as I could about conservation, repairs, and excavations. These details were added to ArcGIS, a piece of software that compiles and analyses data and is used to make up to date maps and geographic information available throughout the organisation. 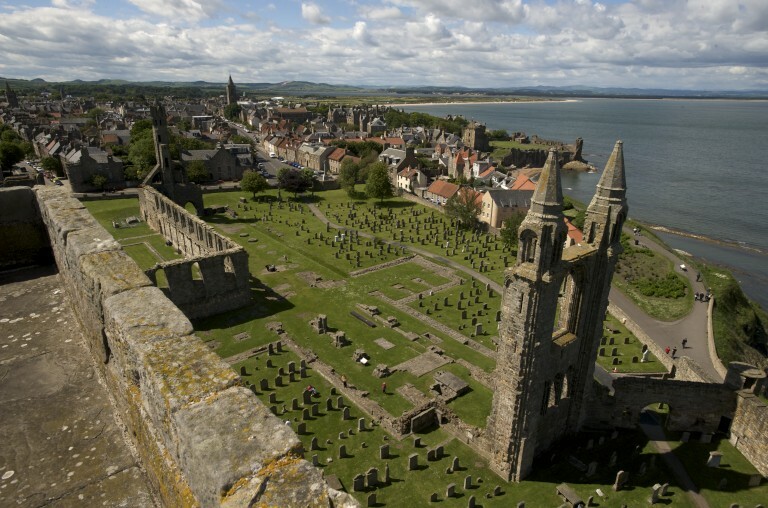 View of St Andrews from the top of St Rule’s Tower, part of the Cathedral precinct. GIS also formed a huge part of my role while working with the Survey & Recording Team. During my time with them I used it to visualise World War II bomb craters around Port Glasgow, and to analyze the effects of aircraft decoy sites. 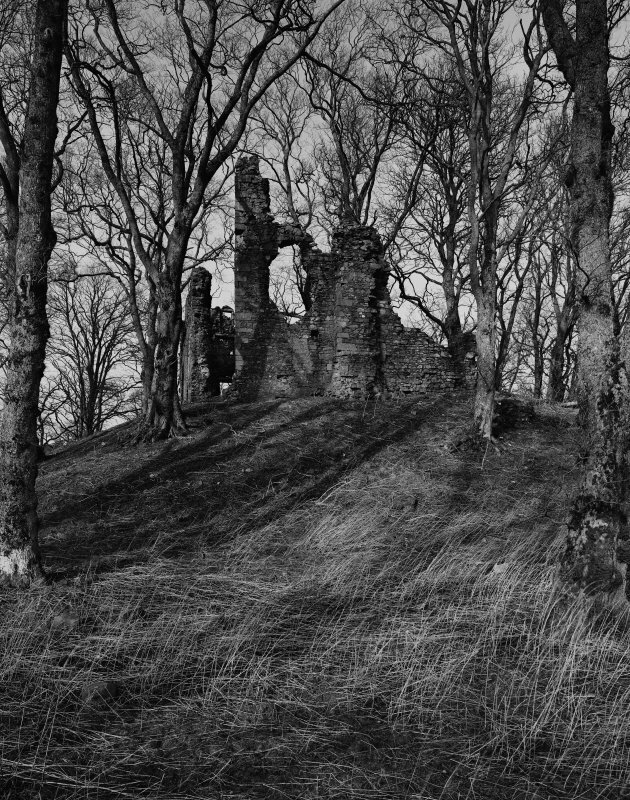 I also had the opportunity to go out to Crawford Castle, an intriguing ruin near the river Clyde in South Lanarkshire. 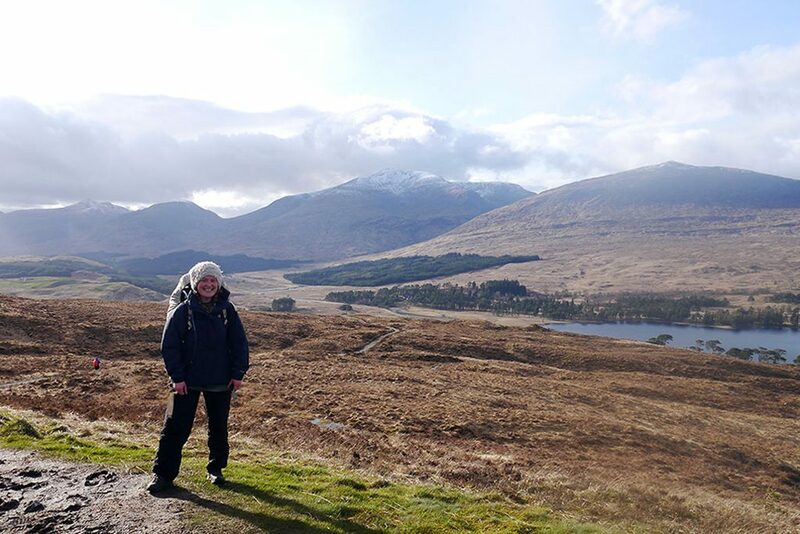 Three days of snow, hail and rain, not to mention a harsh wind, gave me the real Scottish experience – or so everyone kept telling me! Working with the Survey Team brought me multiple times to Crawford Castle. It is not one of the most recognised sites but it is really worth going there! My archaeology internship with HES gave me the chance to get out of my comfort zone, to venture into new landscapes, and learn different ways to understand them. Invitations to lectures, meetings and get-togethers really helped me to become an integral part of the working place and put me in contact with many different professionals, who all have different perspectives on the Scottish landscape. From the very start there was a great deal of support and interest in me and what I wanted to learn. For that support, I am more than thankful. Interested in working or studying with us? Anne Landskron studies Landscape Archaeology at Freie Universität Berlin. During her 2 month internship with us, she worked across several different teams to create GIS based maps and Illustrator drawings.